Un système de freinage à double circuit, et appelé ainsi du fait que les deux circuits agissent sur les deux roues avant et une roue arrière. La pression de la pédale de frein force le liquide en dehors du cylindre maître le long des conduites de frein vers les cylindre récepteur situé près des roues. Le maître cylindre possède un réservoir lui permettant d'être toujours rempli. Modern cars have brakes on all four wheels, operated by a hydraulic system. The brakes may be disc type or drum type. The front brakes play a greater part in stopping the car than the rear ones, because braking throws the car weight forward on to the front wheels. Many cars therefore have disc brakes, which are generally more efficient, at the front and drum brakes at the rear. 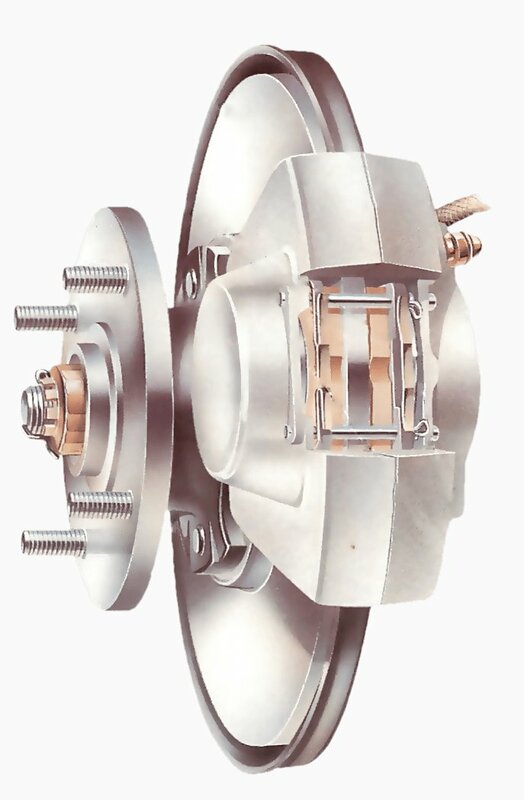 All-disc braking systems are used on some expensive or high-performance cars, and all-drum systems on some older or smaller cars. A hydraulic brake circuit has fluid-filled master and slave cylinders connected by pipes. Le maître cylindre transmet la pression hydraulique vers le cylindre récepteur quand la pédale est pressé. When you push the brake pedal it depresses a piston in the master cylinder, forcing fluid along the pipe. The fluid travels to slave cylinders at each wheel and fills them, forcing pistons out to apply the brakes. Fluid pressure distributes itself evenly around the system. The combined surface 'pushing' area of all the slave pistons is much greater than that of the piston in the master cylinder. Consequently, the master piston has to travel several inches to move the slave pistons the fraction of an inch it takes to apply the brakes. This arrangement allows great force to be exerted by the brakes, in the same way that a long-handled lever can easily lift a heavy object a short distance. 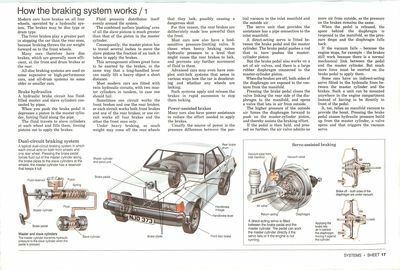 Most modern cars are fitted with twin hydraulic circuits, with two master cylinders in tandem, in case one should fail. Sometimes one circuit works the front brakes and one the rear brakes; or each circuit works both front brakes and one of the rear brakes; or one circuit works all four brakes and the other the front ones only. Under heavy braking, so much weight may come off the rear wheels that they lock, possibly causing a dangerous skid. For this reason, the rear brakes are deliberately made less powerful than the front. Most cars now also have a load-sensitive pressure-limiting valve. It closes when heavy braking raises hydraulic pressure to a level that might cause the rear brakes to lock, and prevents any further movement of fluid to them. Advanced cars may even have complex anti-lock systems that sense in various ways how the car is decelerating and whether any wheels are locking. Such systems apply and release the brakes in rapid succession to stop them locking. Many cars also have power assistance to reduce the effort needed to apply the brakes. The servo unit that provides the assistance has a pipe connection to the inlet manifold. Un servo d'action directe est monté entre la pédale de frein et du cylindre maître. La pédale peut travailler le maître-cylindre directement si le servo échoue ou si le moteur ne tourne pas . A direct-acting servo is fitted between the brake pedal and the master cylinder. The brake pedal pushes a rod that in turn pushes the master-cylinder piston. But the brake pedal also works on a set of air valves, and there is a large rubber diaphragm connected to the master-cylinder piston. When the brakes are off, both sides of the diaphragm are exposed to the vacuum from the manifold. Pressing the brake pedal closes the valve linking the rear side of the diaphragm to the manifold, and opens a valve that lets in air from outside. The higher pressure of the outside air forces the diaphragm forward to push on the master-cylinder piston, and thereby assists the braking effort. If the pedal is then held, and pressed no further, the air valve admits no more air from outside, so the pressure on the brakes remains the same. When the pedal is released, the space behind the diaphragm is reopened to the manifold, so the pressure drops and the diaphragm falls back. If the vacuum fails because the engine stops, for example the brakes still work because there is a normal mechanical link between the pedal and the master cylinder. But much more force must be exerted on the brake pedal to apply them. Frein fermé- Les deux côtés de la membrane sont sous vide. Le frein en action permet de l'air derrière le diaphragme de s'engouffrer, forçant ce premier contre le cylindre. Some cars have an indirect-acting servo fitted in the hydraulic lines between the master cylinder and the brakes. Such a unit can be mounted anywhere in the engine compartment instead of having to be directly in front of the pedal. It, too, relies on manifold vacuum to provide the boost. Pressing the brake pedal causes hydraulic pressure build up from the master cylinder, a valve opens and that triggers the vacuum servo. Le type de base de frein à disque, possède un seule paire de pistons. Il peut y avoir plus une paire ou un seul piston opérant deux plaquettes, comme un mécanisme de ciseaux, à travers différents types d' étriers - un balancement ou un pied à coulisse . A disc brake has a disc that turns with the wheel. The disc is straddled by a caliper, in which there are small hydraulic pistons worked by pressure from the master cylinder. The pistons press on friction pads that clamp against the disc from each side to slow or stop it. The pads are shaped to cover a broad sector of the disc. There may be more than a single pair of pistons, especially in dual-circuit brakes. The pistons move only a tiny distance to apply the brakes, and the pads barely clear the disc when the brakes are released. They have no return springs. Lorsque le frein est appliqué, la pression du fluide pousse les plaquettes contre le disque. Avec le frein fermé , les deux plaquettes touchent à peine le disque. Rubber sealing rings round the pistons are designed to let the pistons slip forward gradually as the pads wear down, so that the tiny gap remains constant and the brakes do not need adjustment. Many later cars have wear sensors leads embedded in the pads. When the pads are nearly worn out, the leads are exposed and short-circuited by the metal disc, illuminating a warning light on the instrument panel. Un frein à tambour avec un leader et un sabot à queue, qui ne dispose que d'un vérin hydraulique ; freins comportant deux segments principaux ont un cylindre pour chaque sabot et sont montés sur les roues avant par ​​un système tout tambour. 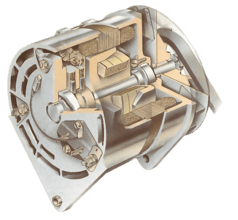 A drum brake has a hollow drum that turns with the wheel. Its open back is covered by a stationary backplate on which there are two curved shoes carrying friction linings. The shoes are forced outwards by hydraulic pressure moving pistons in the brake's wheel cylinders, so pressing the linings against the inside of the drum to slow or stop it. Avec les freins, les sabots sont forcés contre les tambours par leurs pistons. Each brake shoe has a pivot at one end and a piston at the other. A leading shoe has the piston at the leading edge relative to the direction in which the drum turns. The rotation of the drum tends to pull the leading shoe firmly against it when it makes contact, improving the braking effect. Some drums have twin leading shoes, each with its own hydraulic cylinder; others have one leading and one trailing shoe - with the pivot at the front. This design allows the two shoes to be forced apart from each other by a single cylinder with a piston in each end. It is simpler but less powerful than the two-leading-shoe system, and is usually restricted to rear brakes. In either type, return springs pull the shoes back a short way when the brakes are released. Shoe travel is kept as short as possible by an adjuster. Older systems have manual adjusters that need to be turned from time to time as the friction linings wear. Later brakes have automatic adjustment by means of a ratchet. Drum brakes may fade if they are applied repeatedly within a short time - they heat up and lose their efficiency until they cool down again. Discs, with their more open construction, are much less prone to fading. Le frein à main agissant sur la peau au moyen d'un système mécanique, est séparé du cylindre hydraulique, consistant en un levier et en un bras dans le tambour de frein; ils sont alimentés par un câble à partir du levier de frein à main à l'intérieur de la voiture. Apart from the hydraulic braking system, all cars have a mechanical handbrake acting on two wheels - usually the rear ones. The handbrake gives limited braking if the hydraulic system fails completely, but its main purpose is as a parking brake. The handbrake lever pulls a cable or pair of cables linked to the brakes by a set of smaller levers, pulleys and guides whose details vary greatly from car to car. A ratchet on the handbrake lever keeps the brake on once it is applied. A push button disengages the ratchet and frees the lever. On drum brakes, the handbrake system presses the brake linings against the drums. Disc brakes sometimes have a comparable handbrake arrangement, but because it is difficult to place the linkage on a compact caliper, there may be a completely separate set of handbrake pads for each disc.